American Legion Post 602 in Racine conducts a flag raising in front of Home National Bank as part of the Fourth of July parade in Racine. Members of American Legion Post 128 in Middleport salute the flag as the National Anthem plays at Dave Diles Park. Fire trucks make their way down Main Street in Rutland as part of their annual Independence Day parade. A gun salute is held during the opening ceremony of the River Recreation Festival in Gallipolis. Children at the Mason Fourth of July event take part in the watermelon eating contest. 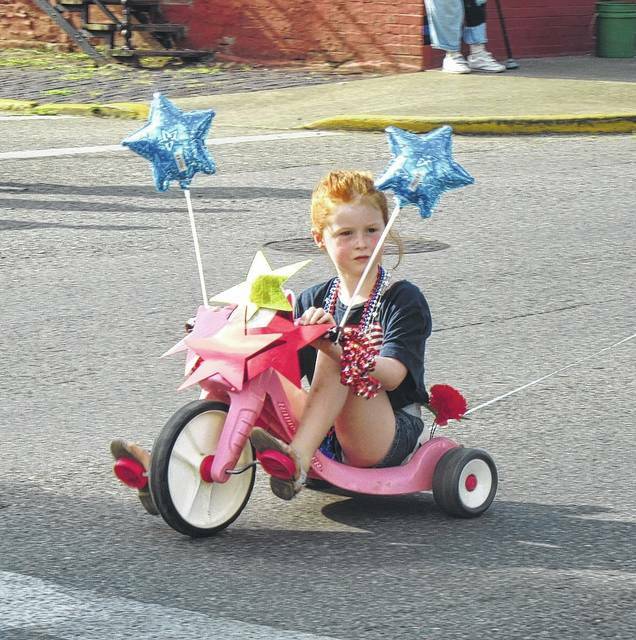 A parade participant decked out in her Red, White and Blue pedals through Middleport. 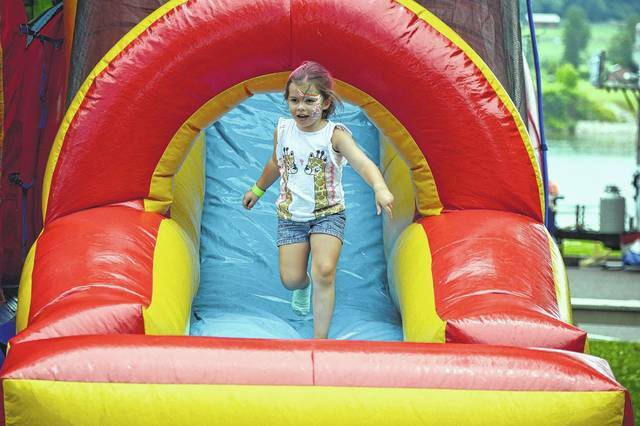 Kids at the River Recreation Festival will have a chance to play on the inflatable slides. A group of bicyclers make their way along the parade route in Racine. OHIO VALLEY —Residents in the region will have numerous opportunities to celebrate Independence Day as festivities are planned throughout Meigs, Gallia and Mason Counties. 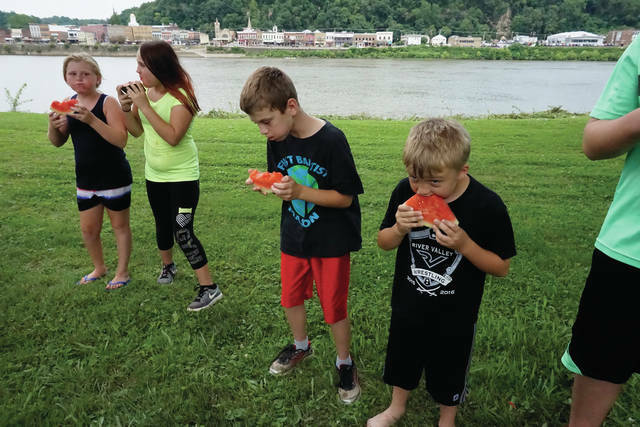 Beginning on Tuesday, the Gallipolis River Recreation Festival will bring activities to Gallipolis City Park and the Riverfront area. Activities in Racine, Middleport, Mason, New Haven and Wilkesville (just across the county line into Vinton County), will take place on July 4, while Rutland will wrap-up the Independence Day celebrations with a day of activities on July 7. The River Recreation Festival opening ceremony will start at 9:30 a.m. on Tuesday July 3, followed by concessions and inflatables at 10 a.m. Gospel music artists will be on stage from 10 a.m. until 2 p.m.. Each group will have 30 minutes on stage starting with Covered by Love, the Singing Shafers, Southern Harmony, Victory river Quartet, the Neal Family, and finally the Raineys from 12:30-2 p.m. The Artisan Shoppe will hold studio classes from 10 a.m. to 7 p.m. The Little Miss and Mister Firecracker Contest will kick off at 2 p.m. after the Gospel Music session. The KidZone opens from 3 to 5 p.m. with 3 to 4 p.m. holding a foam party and 4to 5 p.m. hosting hula hoops, jump rope and water balloons. At 4 p.m. a talent show will start, and is being sponsored by the Gallipolis Junior Women’s Club in the amphitheater. From 6-10 p.m. there will be Contemporary Christian Music artists performing on stage, although final details have not been set at time of print. Mountain Monsters’ television show tracker Wild Bill will be present to give autographs both days of the festival. On Wednesday, July 4, the Baby Tot Sparkler Contest will kick of the day at 9 a.m. with registration opening at 7:45 a.m. Concessions and inflatables will open at 10 a.m. The Artisan Shoppe will again hold classes from 10 a.m. to 7 p.m. KidZone will open at 11 a.m with terrapin races, frog jumping and sack races. From 1 to 3 p.m. will be Nerf Wars. From noon until 3 p.m. there will be country artists on stage featuring James Depre, Bucky Covington, and Branch and Dean. The Rotary Mile, an annual tradition at River Rec, will start at 3:30 p.m. immediately followed by the Fourth of July Parade at 4 p.m. Evening entertainment will begin at 6:30 p.m. in the amphitheater with Nick Clagg and Briar Williams. They will be followed by Dillon Wade Jarrell at 8 p.m. and Devin Henry at 9 p.m. All of the entertainers Wednesday evening are local artists. 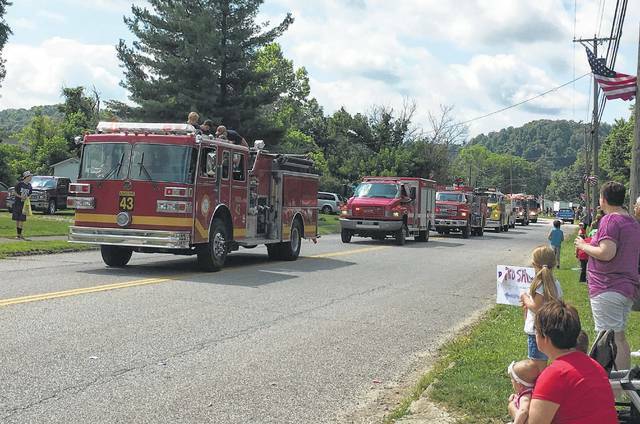 Independence Day will kick-off in Meigs County with the parade in the village of Racine. The parade begins at 10 a.m., with line-up at 9:15 a.m. in the Southern High School parking lot. Prizes for parade entries will be given in 3 categories: bikes, floats, vehicles. Following the parade will be the Chicken BBQ at the fire stations with serving to begin at 11 a.m. Numerous flavors of homemade ice cream will also be available. In a throwback to celebrations from years ago, a Frog Jump competition will be held at Star Mill Park with registration beginning at 5 p.m. There is a $3 entry fee. Participants can bring their own frogs or “rental frogs” are available for $1. Age groups for the event are 12 and under, 13-17 and 18 and up. Prizes will be awarded for first, second and third in each class, as well as the overall longest jump of the day. The day’s events will conclude with fireworks at 10 p.m. at Star Mill Park. In the Bend Area of Mason County, July 4 will begin with a parade in New Haven at 11 a.m. Line-up will take place at 10:30 a.m. at the New Haven Community Building, and the parade will travel down Fifth Street. Free swimming will also continue from noon to 5 p.m. at the New Haven Municipal Swimming Pool. Anyone under the age of six years must be accompanied by a parent or guardian. A parade will also start activities in the Town of Mason, which will continue until 3 p.m. The line-up for the noon parade will begin at 11:30 a.m. on the block of Martin and Maple streets. It will then proceed to the Stewart-Johnson V.F.W./Lottie Jenks Memorial Park, where the remainder of the activities will take place. Ongoing throughout the afternoon will be inflatables for the children, including a bounce house, an obstacle course, and a water slide. K&D Karaoke will provide music. Children’s games will be offered, with prizes going to the winners. A watermelon eating contest, water sponge game, and others will be played. The Mason Police Department will have a children’s obstacle course where participants can “catch the bad guy,” and become a junior officer for the day. Vendors will be set up, and free bottled water will be given out by the town. The Mason Fire Department will be selling hotdogs and tacos in a bag, while the Mason United Methodist Church will be selling cotton candy and popcorn. Any other vendors wanting to set up can contact the town hall at 304-773-5200. The Middleport July 4th Celebration will kick-off at 4:15 p.m. on Wednesday with music at Dave Diles Park with DJ Kip Grueser. Music will continue until 7:45 p.m. when the band “Remember Then” will take to the park stage. The parade begins at 6 p.m., with line-up at 5:30 p.m. beside Dairy Queen and down First Street. Grand Marshalls for the parade will be Roscoe and Mary Wise. Roscoe Wise is a member of American Legion Feeney Bennett Post 128 n Middleport and Mary Wise is involved with the Riverbend Arts Council. Following the parade will be a flag raising ceremony at Dave Diles Park conducted by Feeney Bennett Post 128. Fireworks will launch at 10 p.m.
Events and fireworks in Middleport are sponsored by the Middleport Community Association, Village of Mason and many local businesses and individuals. The Wilkesville 4th of July parade will be held at 11 a.m. in downtown Wilkesville. Registration for the parade begins at 10 a.m. at the new fire station. Prize lists are as follows: Children 1-10, $50, plus a $10 ParMar Gift Card. (Registration across from the 160 Restaurant); Best car entry, $75, plus $10 ParMar Gift Card; Best float, 475, plus $10 ParMar Gift Card; Most unique entry, $75, plus a $10 ParMar Gift Card; Best horse and rider entry, $100, plus $10 ParMar Gift Card. Food will be served at the Wilton Community Center following the parade. Rutland Fire Department’s 4th of July event will be held on Saturday, July 7. The parade through town will begin at 11 a.m. with line-up at 10 a.m. Line-up will be on Brick Street and Depot Street, with fire trucks and big floats at the school. The National Anthem will be played after the parade at the Fireman’s Park by the Meigs High School Marching Band, with a flag raising to be held. Bingo begins at noon and will go all the way to 11 p.m.. Games range from $.25 to $1. Concessions will open at 8 a.m. and will remain open throughout the day. Additional games, activities and a dunking booth will take place in the park. At 1 p.m. the Riveside Cloggers will be on the stage. Next Level will perform at 4 p.m. with Double Shot performing at 8 p.m.
Fireworks will launch at 11 p.m. on Saturday night. Ohio Valley Publishing freelance writer Mindy Kearns contributed to this report. https://www.mydailytribune.com/wp-content/uploads/sites/42/2018/06/web1_7.1-ATR-1_ne2018629114640704.jpgAmerican Legion Post 602 in Racine conducts a flag raising in front of Home National Bank as part of the Fourth of July parade in Racine. 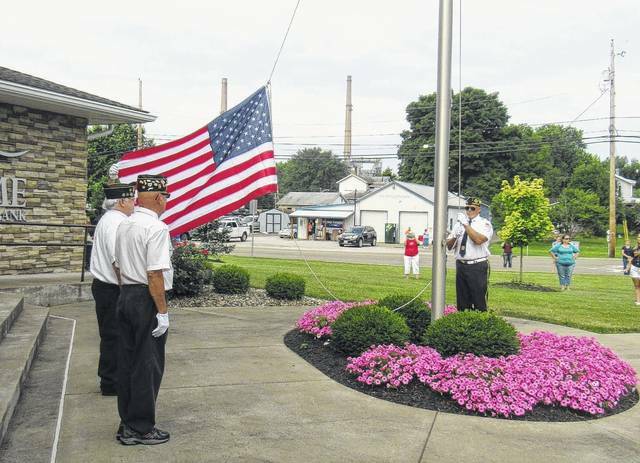 https://www.mydailytribune.com/wp-content/uploads/sites/42/2018/06/web1_7.1-ATR-2_ne2018629114643485.jpgMembers of American Legion Post 128 in Middleport salute the flag as the National Anthem plays at Dave Diles Park. https://www.mydailytribune.com/wp-content/uploads/sites/42/2018/06/web1_7.1-ATR-3_ne2018629114645775.jpgFire trucks make their way down Main Street in Rutland as part of their annual Independence Day parade. 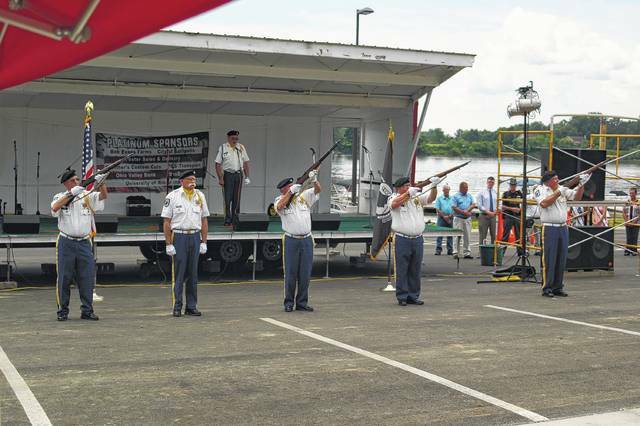 https://www.mydailytribune.com/wp-content/uploads/sites/42/2018/06/web1_7.1-ATR-4_ne2018629114651597.jpgA gun salute is held during the opening ceremony of the River Recreation Festival in Gallipolis. https://www.mydailytribune.com/wp-content/uploads/sites/42/2018/06/web1_7.1-ATR-5_ne2018629114655840.jpgChildren at the Mason Fourth of July event take part in the watermelon eating contest. https://www.mydailytribune.com/wp-content/uploads/sites/42/2018/06/web1_7.1-ATR-6_ne2018629114723751.jpgA parade participant decked out in her Red, White and Blue pedals through Middleport. https://www.mydailytribune.com/wp-content/uploads/sites/42/2018/06/web1_7.1-ATR-7_ne2018629114725689.jpgKids at the River Recreation Festival will have a chance to play on the inflatable slides. 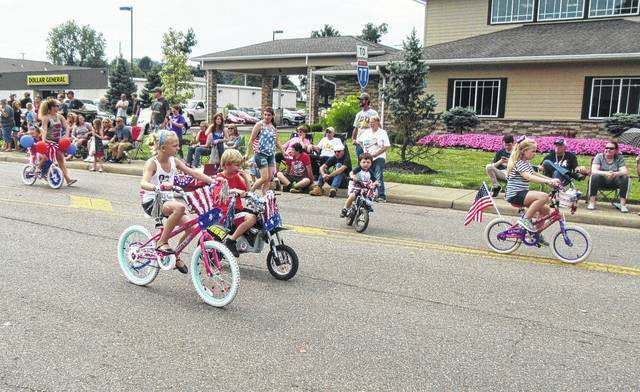 https://www.mydailytribune.com/wp-content/uploads/sites/42/2018/06/web1_7.1-ATR-8_ne2018629114728311.jpgA group of bicyclers make their way along the parade route in Racine.